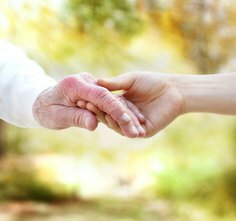 Choosing a Caregiver | Gerald Winters P.C. As a child of a senior citizen, you are faced with many choices in helping to care for your parent. You want the very best care for your mother or father, but you also have to take into consideration your personal needs, family obligations and finances. When choosing a caregiver for a loved one, there are a number of things to take into consideration. Time. Do you require part- or full-time care for your parent? Are you looking for a caregiver to come into your home? Will your parent live with the caregiver or will you put your parent into a senior care facility? According to the National Alliance for Caregiving, 58 percent of care recipients live in their own home and 20 percent live with the caregiver. You should consider your current arrangement but also take time to identify some alternatives in the event that the requirements of care should change in the future. Family ties. If you have siblings, they probably want to be involved in the decision of your parent’s care. If you have a sibling who lives far away, sharing in the care responsibilities or decision-making process may prove to be a challenge. It’s important that you open up the lines of communication with your parents and your siblings so everyone is aware and in agreement about the best course of care. Social interaction. Many seniors fear that caregivers or care facilities will be isolating, limiting their social interaction with friends and loved ones. It’s important to keep this in mind throughout the process and identify the activities that he or she may enjoy such as playing games, exercising or cooking. Make sure to inquire about the caregiver’s ability to allow social interaction. Someone who is able to accommodate your parent’s individual preferences or cultural activities will likely be a better fit for your mother or father. Credentials. Obviously, it is important to make sure that the person or team who cares for your parent has the required credentials. Run background checks and look at facility reviews to ensure you are dealing with licensed, accredited individuals. You may choose to run an independent background check or check references for added peace of mind. Scope of care. If you are looking for a live-in caregiver, that person is responsible for more than just keeping an eye on your mother or father—he or she may be responsible for preparing meals, distributing medication, transporting your parent, or managing the home. Facilities typically have multidisciplinary personnel to care for residents, but an individual will likely need to complete a variety of tasks and have a broad skill set to do it all. Money. Talk to your parent about the financial arrangements that he or she may have in place. If this isn’t an option, you will likely need to discuss the options with your siblings or your parent’s lawyer—or check your mother’s or father’s estate plan—to find out more about available assets and how to make financial choices pertaining to your parent’s care. Prepare. Upon meeting the prospective caregiver or visiting a facility, it is important to have questions prepared ahead of time so you can gather all of the information necessary to make an informed choice. Finally, be prepared to listen to your parent’s concerns or observations so you can consider their input in the decision. If he or she is able, they will likely want to make the choice themselves. Choosing a caregiver for your parent is an important decision that weighs heavily on most adult children but with the right planning and guidance, you can make the best choice for your family. Once you find the right person, make sure to follow up as care continues and to check in with your mother or father to ensure the caregiver is the perfect fit.